Readers may find the following talk at Suffolk Record Office, Bury St Edmunds interesting. 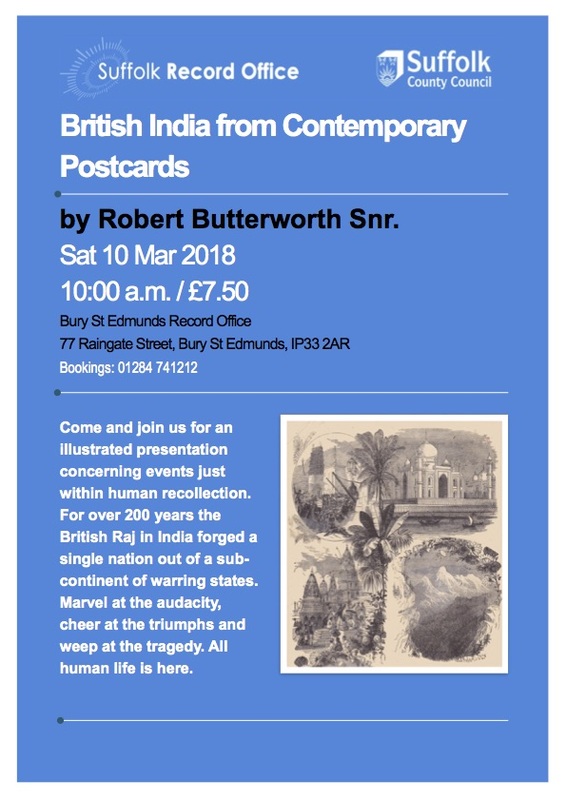 I heard Robert Butterworth give one of his British India postcard talks at the FIBIS Spring Open meeting in May 2012 which was thoroughly enjoyed by those who attended and I look forward to seeing this presentation too. Come and join us for an illustrated presentation concerning events just within human recollection. For over 200 years the British Raj in India forged a single nation out of a sub-continent of warring states. Marvel at the audacity, cheer at the triumphs and weep at the tragedy. All human life is here. Robert Butterworth Senior travels British India by postcard.